If you've ever dreamed of experiencing the natural peace and quiet book your stay at this lovely cabin-style home. 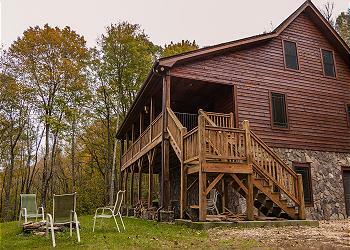 The cabin sits on 35 gorgeous wooded acres in the North Carolina mountains, near the Tennessee border. Three levels of living space in this cabin lets your group spread out and enjoy a little privacy, as well as togetherness and socializing. On the main level you're welcomed by a large and open great room with cathedral ceilings, a stone fireplace, a big flatscreen TV and lots of comfortable seating. The open floorplan provides great flow, joining the living area with the huge kitchen and two dining tables - one seating 4 guests and the other accommodating another 6. The big, open kitchen is beautifully equipped with stainless appliances, granite counters, seating at the island bar, and all the dining accessories you need for entertaining or family meals at home. The great room opens directly onto the wide rocking chair porch, where you can enjoy the beauty of nature all around you, as well as long-range mountain views. This porch has a hammock as well as plenty of seating - another wonderful area for conversation or peaceful solitude. Or perhaps a cat nap? Two bedrooms are also located on the main level, one with California King and the second with a Queen. The shared full bath includes a large jetted tub, as well as a walk-in shower. The lower level offers a second living area with a cozy wood stove, another flatscreen TV, and a ping pong area. This is the perfect spot for family fun. A charming barn door slides open to reveal another bedroom with a queen bed, a bunk bed with full size bottom and twin size top and a bathroom. This lower level opens to its own covered patio with direct access to the lawn, which is large and flat - great for games, Frisbee, or just running around. There's also a fire pit, so you can close out your day of fun and adventure around a campfire, roasting marshmallows and gazing in amazement at the canopy of stars above. For more private sleeping areas, head up to the top level, where you'll find a loft with a futon, plus an additional upstairs bedroom with two full beds and one twin. When you're ready to get away from it all and enjoy the natural wonder of the mountains, The Gathering Place is perfect for you, your friends and your whole family. Nestled in the Blue Ridge Mountains, The Gathering Place is located in Creston, NC, near the North-Carolina-Tennessee border. From this home base, you're just a 30-minute drive to West Jefferson, 40 minutes to Boone, or 15 minutes to Mountain City, TN and the Watauga Lake area. You can also easily access Blowing Rock and all the natural attractions along the Blue Ridge Parkway. But don't forget: you have 35 acres to explore in your own front yard! In the High Country, area recreation opportunities include fishing, hunting, hiking, biking, canoeing, tubing, zip-lining, cave exploration and more, all within easy reach of The Gathering Place. Wherever you go, gorgeous scenery awaits you at every turn. In the quaint mountain town of West Jefferson you'll find restaurants and terrific shopping, including antique stores and art galleries. This is small-town Americana at its finest. Drive a little further to Boone or Blowing Rock, for an even wider assortment of dining, entertainment and shopping options. If you're dreaming of a snowy mountain winter, you've also come to the right place. Enjoy sledding, snowboarding, skating - and of course skiing - all winter long. Or watch the snow fall softly and serenely outside, while you're cozy inside by the fire. "The cabin was beautiful and breathtaking. Had a great time with my wife, me, 5 grandchildren,6 kids and 1 friend. Room for all." "This house was wonderful! Everything seemed new and clean, and it was very spacious. We had a great time exploring the property, and found plenty to do to enjoy our time. There was a nice view in the day, and clear nights revealed tons of stars. Everything was as described on the property listing, and the checkout procedure was a breeze. The only challenge was finding the house. The email I got with the rental details recommended printing off directions, which thankfully we did! The GPS didn't work on some of the winding mountain roads. It would have been nice if some directions were provided for us though, because what we printed ended up not being exactly what we needed and we got lost for about an hour. Once we found the house and realized the way we SHOULD'VE gone it probably wouldn't have been a big deal at all. So just make sure you know the route you plan to take and print the directions that match that. Even with all of that though, this place was worth it!"